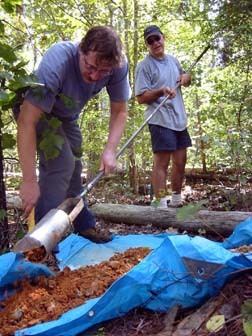 Daniel Richter (right) and Paul Heine sample soils at Calhoun Experimental Forest in South Carolina to determine how much humans have affected the soils. More than any other species, Homo sapiens alters the wider environment, a fact that has become increasingly apparent to soil scientists. Citing studies by himself and fellow researchers, Daniel Richter of Duke University's Nicholas School of the Environment and Earth Sciences in North Carolina asserts that human-soil interaction in the modern age is so extensive and its potential consequences so profound that it warrants the acknowledgement of a new geologic epoch. Humankind has thus far transformed more than half of Earth’s soils to suit its needs — agriculture and infrastructure chief among them — and has become the preeminent force changing Earth’s surface, Richter says. Geologists who specialize in studying landforms “now consider humanity to be the Earth’s primary geomorphologic agent,” he says. Such a bold statement is possible due to volumetric estimates of how much ground humans displace, Richter and colleagues reported in Soil Science in December. Moving earth in the construction of roads, cities and other public works is not the only way humans affect soils. The placement of crops, the disposal of wastes and the concentration of carbon dioxide in the atmosphere are a few of the many human-manipulated variables that contribute to soil changes, Richter says. All these factors influence Earth’s ecosystems. “Like it or not, we live in the Anthropocene age,” Richter says, employing a term — reputedly coined by chemist Paul Crutzen of the Max Planck Institute for Chemistry in Germany — that describes the time of increased human impact on Earth since the Industrial Revolution. Especially in pedology, the science of soil, there exists an urgency to more fully account for the effects imposed by humans on the Earth, Richter says. Modern pedologists, he says, must not only consider soils solely as a “natural body,” one formed by natural processes, “but as a historical and a cultural body as well,” one shaped by human history and contemporary human activity. He adds that doing so entails paying particular attention to the dynamic properties of soil, such as acidity, organic matter, Fe oxides, nutrient makeup and porosity, which can change substantially over the course of decades. In the new study, which is primarily a compilation of previous work by many researchers, Richter cites previous research conducted by himself and colleagues at the Calhoun Experimental Forest in South Carolina in which pedologists linked such properties to natural and human influences. The studies correlated ongoing cultivation of pine trees to acidification of soil, and linked both historical cotton management and local bedrock composition to acid-neutralizing capabilities. These correlations, Richter says, are valuable as they assess the ramifications of past and present human activity, while not neglecting natural factors. Richter says researchers in many fields need to collaborate to better understand and preserve Earth’s soils. David Montgomery, a geomorphologist at the University of Washington in Seattle, agrees. “The way people treat their land, their soils in particular, comes to shape the way the soils treat them,” says Montgomery, who has recently published the book Dirt: The Erosion of Civilizations, in which he examines several past civilizations brought down by changes in soils. People need to be aware of the interplay — and codependence — of humans and soils, Montgomery says.